Working out how you will finance your property purchase in the USA is arguably the most vital part of the process. It’s so important to make sure you don’t over stretch yourself, and know that you can afford the new life you desire in the US – and to do this, you need to be thorough when assessing all financial implications. Purchasing a property involves costs over and above the purchase price. You will need to factor in buying costs, the expense of keeping the property up and running, how you will fund your life in the States – and that’s before you’ve even considered the new tax and pension implications of owning property abroad. There are a number of financial pitfalls buyers can fall into when buying in the USA. We’re here to guide you through every stage, from the minute the idea comes to you, all the way through to the day you’re handed the keys, to ensure your purchase runs smoothly. Over the last decade we’ve built a team of trusted experts who can assist you in getting all of your financial affairs in order, leaving you to relax and enjoy the benefits of being an American homeowner. The very first step towards any overseas property purchase is to determine how you’ll finance your plans, for example, will you use cash, a mortgage, or a pension fund? You will need to assess how much you have to spend, what the likely deposit will be, and your method of transferring funds to the USA when the time is right. There are a number of unexpected costs involved in buying US property, which you will need to factor into that all-important budget. You should plan for taxes, legal fees, and other additional costs. You also need to consider the effect of exchange rate fluctuations on your budget, and how you can save money on transfers. Tax planning is one of life’s necessary evils. You need to make sure that your tax affairs are in order in the UK to reflect your new status, and to make sure that the liabilities you incur are accurate. How you are taxed will depend entirely upon your personal circumstances, where you’re located most often, what assets you have, and where you are earning income. Always consult an experienced and independent tax advisor who will be able to guide you according to your personal circumstances, plus they may be able to help you avoid being taxed in both countries. To ensure you’ve taken the necessary steps to protect the interests of your loved ones in the event of your death, always consult an independent financial advisor. There are a number of options for managing your pension when you move to the USA, or purchase property there. It’s possible it could be beneficial to move your pension into a different scheme, or your circumstances might mean receiving payments into a UK bank account continues to make the best sense. Consult an independent financial advisor about which method works for you, and how your choice will affect your tax situation. Insuring your new property and life in the USA is a cost that needs to be factored into your budget. It pays to research your options to guarantee you find an insurer who meets your requirements, at a price you can afford. Enlisting the services of a currency exchange specialist can save you both time, and money, on all of your currency transfers from the UK to the USA. An expert can lock in favourable exchange rates, allowing you to effectively budget as you’ll always know how much is going in and coming out of your accounts. To ensure you get the most from your money, it’s important to manage any regular payments that you’ll need to make between the UK and the USA. 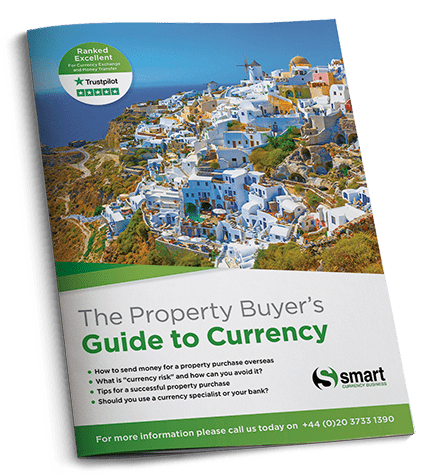 Download your free copy of Smart Currency Exchange’s report, “Three Essential Steps to Buying Property Abroad”, which outlines how to best manage all of your currency transfers to maximise your savings. You need to establish the best way of receiving your pension whilst living in the USA, to ensure you get the most from your pension pot. There are tax implications that come with owning property overseas, especially if you plan on letting the property out. We advise speaking to a tax advisor to guarantee you are aware of all the national and local taxes you’ll be liable for once you own in the USA. At some stage, you will need to open an American bank account. As there are a huge number of banks to choose from, it pays to shop around to find one that suits your needs. If you’re planning on letting out your property to holidaymakers, there are a number of financial, legal and logistical considerations you’ll need to take into account. Find out how to rent your property in the US, and how to ensure you’re complying with all the necessary legislation. We run an annual survey to compare key expenses and living costs in the USA with the UK. Although many costs are similar, it’s important to be aware of what to expect so you can budget effectively, and so that you won’t be hit with any nasty surprises.